August 29, 2003, L. G. Crabo. 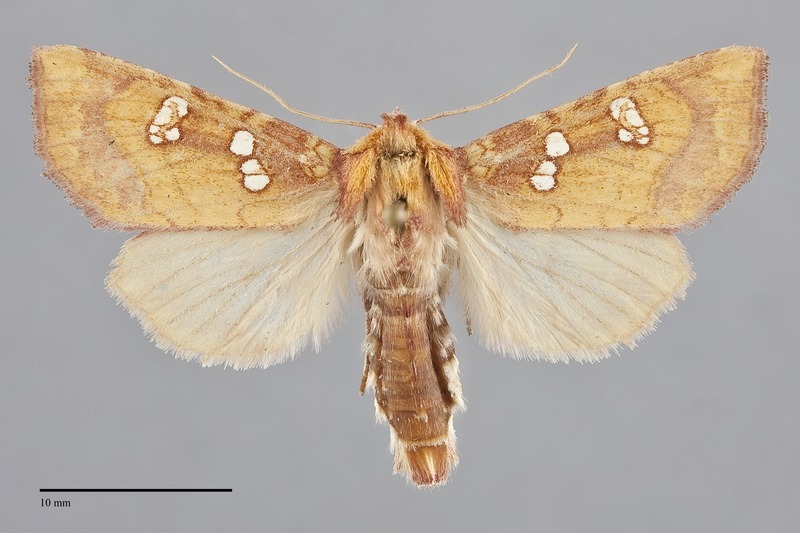 Papaipema limata is a medium-sized yellow moth (FW length 15–18 mm) with net-like white forewing spots and faint red-brown markings that flies in wetlands in steppe regions during the fall. The forewing has a pointed and slightly hooked apex. The ground color is bright yellow, purest on the posterior and distal median area and at the apex. Orange-brown suffusion is present in the antemedial area, in the cell between the spots, and in the terminal area. The subterminal area is similar with a slightly purple tint that strongest anteriorly. The transverse lines are orange-brown to purplish, double filled with yellow. The basal line separates the yellow anterior wing from the darker orange-brown posterior base and similar antemedial area. The antemedial line is partially obscured by the adjacent shading and is weak posteriorly where it bulges laterally above the margin. The median line is red-brown, a nearly straight line angling toward the base from the lower reniform spot. The postmedial line is smooth or slightly scalloped, smoothly curved across the anterior wing and then nearly straight parallel to the median line from the level of the lower cell to the posterior margin. The subterminal line is yellow, faint but complete, offset below the apex and slightly irregular elsewhere. The terminal line is thin, dark red-brown or absent. The fringe is red-brown or purple-gray. The spots are outline in dark red-brown and filled with white. The round orbicular spot is partially fused to a figure-eight-shaped subreniform spot that is bisected by a thin red-brown line. The reniform spot is ovoid, slightly indented on its medial side, occasionally on both sides, with a net-like pattern formed by a central yellow and red-brown crescent and red-brown veins. The hindwing is immaculate light yellow. The head and thorax are orange-brown and yellow, slightly darker toward the edges of the collar and tegulae. A strong median tuft is present on the anterior thorax. The base of the antenna (scape) is pure white. The male antenna is bead-like. This species can be recognized as a Papaipema by its yellow and orange-brown color and white forewing spots. 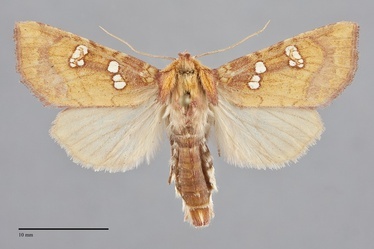 Papaipema limata is similar to Papaipema insulidens with which it occurs but has a lighter yellow forewing color, absence of a red-brown ocellus in the orbicular spot, and a smoother subterminal line that lacks scalloping. Hydroeciodes serrata, a member of the tribe Eriopygini that flies in the mountains of southeastern Idaho in our region, is similar to a Papaipema but has similar features to P. insulidens to those described above. It has fine hairs on its eyes like other members of its tribe. 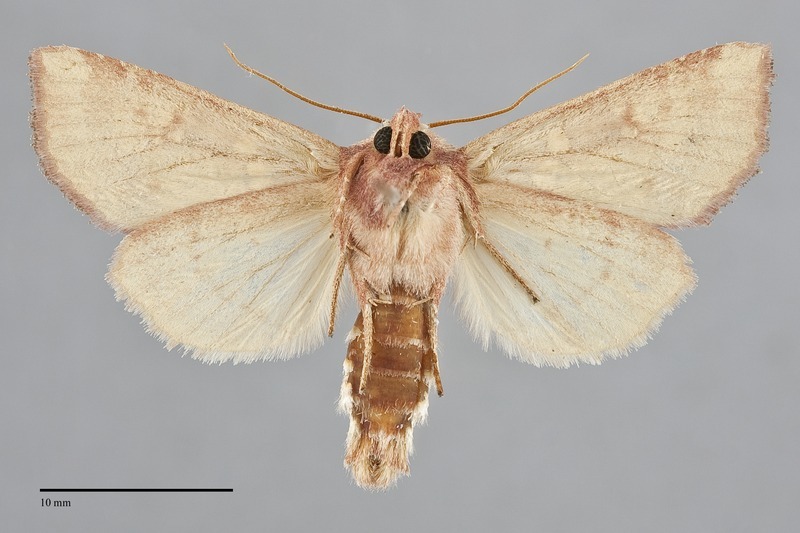 Males of H. serrata have wide bipectinate antennae unlike the thin ones of Papaipema. The type locality of Papaipema limata Bird is Washington, Pullman. This species flies in low-elevation wetland habitats of riparian zones in steppe regions, including along creeks and rivers. Papaipema limata has been found in the dry interiors of our region. It is found in the northern and eastern part of the Columbia Basin in Washington, eastern Oregon, and southern Idaho. This range of this species is poorly known. It occurs in Utah as well as in our region and might be widespread in the Intermountain region. No information is presently available regarding larval foodplants of this species, but it undoubtedly bores into the stems of herbaceous plants like the larvae of all Papaipema species for which the early stages are known. It is associated with large umbels (Apiaceae) along the Malheur River in eastern Oregon and this is a suspected foodplant. Papaipema limata flies during the fall and has been collected from late August through September in the Northwest. It is nocturnal and comes to lights. This species does not wander from its wetland and is rarely collected unless traps are placed in or very near to its habitat.